Nashville Predators defenseman Seth Jones does not often get to see his youngest brother Caleb play hockey for the United States Under-18 National Team Development Program, so when he had the opportunity to see him during the NHL All-Star Break this past weekend, Seth took advantage of it. Seth and his mother, Amy, traveled approximately two hours south from Nashville to Huntsville to see the NTDP take on Alabama-Huntsville for a pair of exhibition games. The Jones family were treated to another win Sunday, by a score of 4-2. Caleb is following a similar path of development as Seth did in 2010-12 by playing for the NTDP. 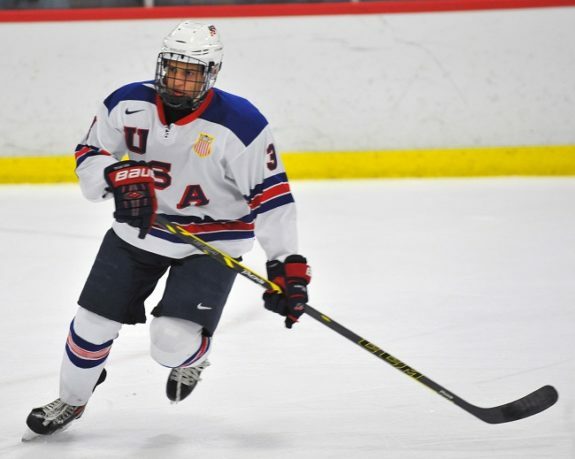 In 109 games with the NTDP, Seth scored 12 goals, 50 assists. Through 86 games, Caleb has 3 goals, 23 assists. Watching Caleb play would remind any Predators’ fan of Seth. Caleb tends to pinch into the play on an offensive rush. Caleb is eligible for the NHL Draft this year in Sunrise, Florida. It does not hurt a 17-year-old to have an older brother close by to give him tips on how to overcome anxiety on draft day. 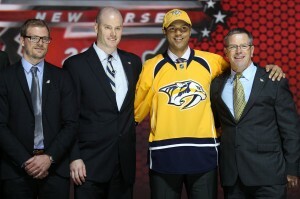 Seth, surprisingly, dropped to 4th overall in 2012 and sought to make the teams who passed on him pay. Unlike Seth in 2012, Caleb is not a highly touted prospect entering the 2015 draft. Caleb is ranked 77th in North American skaters by NHL Central Scouting, and many believe the low ranking is simply because of his size — 6-foot, 194lbs. There may be an opportunity for the Predators to grab Caleb off the board in the fifth round, uniting the brothers in the same NHL organization. Despite being older, wiser, more skilled, taller and larger, Seth continues to be challenged by a confident Caleb on the ice. Why? Because that is what brothers do.